With summer right around the corner, many people are gearing up to spend time at the pool. If your senior loved one plans on swimming or tanning by the pool this summer, there are some precautions to consider. The following are some essential safety tips for at-home Rhode Island caregivers to remember. Due to natural deterioration in the skin’s texture, senior citizens with a fair complexion are at a high risk of getting sunburn on a clear summer day. Whenever they plan to spend at least an hour in a pool area, it’s important for the elderly to apply a sunscreen with SPF rating of 30 or above. Polarized sunglasses should also be worn to absorb intense UV rays that can exacerbate existing eye problems like glaucoma and cataracts. Normal kidney function tends to get worse with age, so seniors are naturally at risk of dehydration on any given day. To prevent dehydration in the summer, it’s a good idea for respite caregivers in Rhode Island to encourage seniors to drink at least one liter of fluids for every hour of outdoor activities during the summer. A cold bottle of water is the best option since it’s going to cool off the body and minimize side effects like upset stomach. Heat stroke is a serious concern for any elderly person who spends a lot of time outside during the summer. After swimming under direct sunlight, seniors should immediately seek some shade under trees, umbrellas, awnings or other structures. Seniors with high blood pressure and cardiovascular problems can experience a heat stroke by doing moderate activities on a warm day. Ice cubes and battery-powered fans can provide essential relief near the pool. To prevent drowning, seniors should have access to swimming aids such as traditional foam rings that always stay buoyant. It’s also a good idea for elderly people to wear inflatable swimming aids on their arms or necks. Inflatable rafts and other ride-on toys are some other pool items that provide safety for seniors. 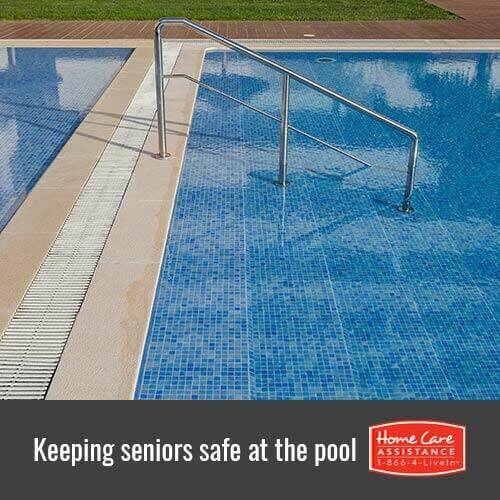 Seniors who have mobility problems are likely to fall while walking on slippery surfaces near the pool. Sandals and other footwear with rubber soles should be worn to safely navigate the poolside area. Elderly people should also carefully get up from relatively lightweight wicker or plastic furniture that could easily overturn. If your senior loved one plans to be at the pool this summer, heed the advice above to ensure his or her safety. In addition to these tips, it’s also important to make sure your loved one is accompanied to the pool. While you may not always be available to accompany your loved one, you can rely on Home Care Assistance of Rhode Island to help. Our trusted Rhode Island home care agency provides flexible live-in, hourly, and respite care that allows family members to manage other important tasks knowing their loved ones are looked after by highly trained professionals. Call (401) 284-0979 today and speak to a friendly Care Manager about how our services will benefit your loved one. Be sure to also schedule a free in-home consultation.